While I’m still organizing my thoughts re: Christmas crafting–Craft-stravaganza-ing!–here’s the beginnings of the whole shebang. I’ve ordered probably 25 yards of fabric in the past few weeks (in case my husband is reading: don’t worry I had coupon codes… :[ ) and have decided that this might be the only/last year that I have time to make it a homemade Christmas. Tree skirt? YES please. Table toppers? Quilted stockings? Handmade gifts? EMBROIDERED GIFT TAGS?! Well, maybe. But this apron is a good start. 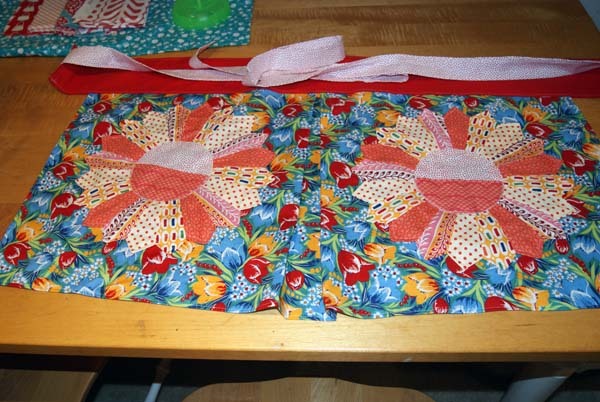 The ever-talented Maureen Cracknell of Maureen Cracknell Handmade posted this tutorial at the Riley Blake blog about a month ago, and I knew it’d be a big part of Christmas 2012. 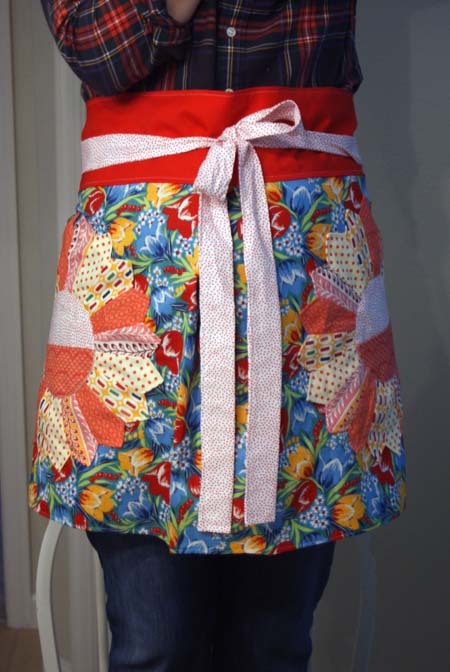 I have a grandiose packaging-gifting plan (to be shared once I’ve gathered the bits and pieces) and it involves aprons, and it, in part, involves this (free! super-cute!) apron tutorial. Another title for this post could have been, “why did it take me so damn long to buy an EZ Dresden ruler?” because, seriously. I’ve been drooling over Dresden blocks and Dresden quilts of all ages and makes for the three years I’ve been sewing but I had pretty much convinced myself that Dresdens were fiddly and hard and I should just save them for when I knew what I was doing. Cut to now, when I still don’t know what I’m doing, but managed to whip out these two Dresdens for the apron pockets in about two hours, during which time I also fed, bathed, storytime’d, and put to bed a toddler. Easy-peasy. Normally I don’t have much use for half aprons, but when I saw this tute I had a hunch that the wide waistband was meant to be tied high–at natural waist, not where your jeans hit–and I was so right! 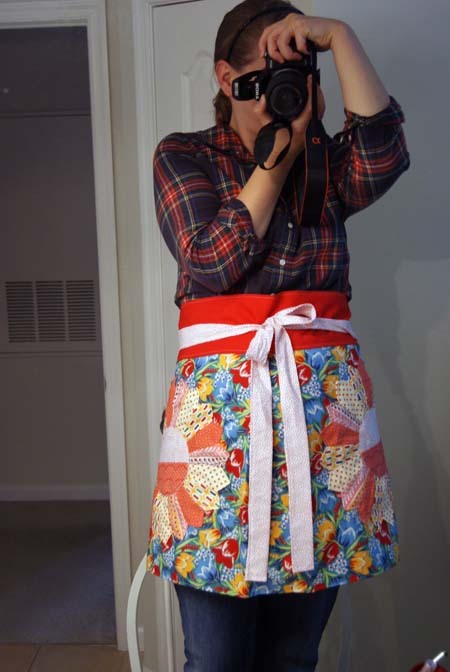 It’s pretty and flattering AND it’ll keep Thanksgiving pie flour off my shirt. Right where the counter hits my midsection is my messy spot, and this apron’s got it covered. Self-portraits are the awkwardest, yeah? The wide waistband and wide ties are what I like best too. Why must you tempt me to make my to-sew list longer.